Congratulations go out to all the 2017 Grammy winners! Especially to Twenty One Pilots, The Chainsmokers, Daya and Flume. All who took some time out of their hectic schedule to hang in the mix with yours truly and talk with us while on their journey to Grammy success! Here are a few highlights from my EXCLUSIVE interviews with music royalty: Flume describes his Grammy winning album, Skin, as melodic and a little off. Flume says he makes music he wants to hear and that his biggest inspiration isn’t other people’s music but technology and using it in a way that hasn’t been used before. Tyler of Twenty One Pilots told us his favorite track from their #1 selling album Blurryface is Lane Boy and Josh likes The Judge. But their fave may have changed since Stressed Out is the track that gave TØP their first Grammy. The Chainsmokers talked with us about the evolution of dance music and how they love where it’s going. Daya is totally blown away with the turn her life has taken saying her parents have given her total support and are now involved in her music career. 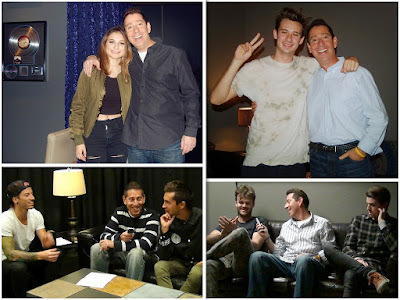 You can catch my full backstage conversations with these now Grammy winning artists under the Interview Tab. This weekend I’m bringing you a party soundtrack filled with tons of musical royalty. I’m droppin’ the needle on exclusive HK remixes of Maroon 5, Ed Sheeran, Rihanna, Shawn Mendes, Bruno Mars and Grammy wining Daya. Plus new tracks from Katy (thank God she finally released a new song) Perry, Starley, Hey Violet, Marian Hill and Zara Larsson! I just can’t help but rework a Daft Punk classic and mix up a few other surprises from the day! Weather you get Presidents Day off or (like me) NOT we’re still gonna party like it’s a three day weekend! BEAT OF YOUR HEART™ VALENTINE'S DAY GIVEAWAY!